Injection Molded Plastic Market size was calculated at over 100 million tons in 2015 with growth forecast at more than 5% CAGR up to 2023. Global plastic packaging demand was more than USD 285 million in 2015 and is projected to exceed USD 425 million by 2023. Growth in demand for processed food, consumer goods and beverages boost the packaging industry growth. Key polymer properties, durability, temperature resistance, corrosion resistance and ability to withstand wear & tear may drive demand in this segment. Shift in trend to replace steel with high performance materials for automobile manufacturing in order to enhance vehicle performance is expected key industry trend to stimulate injection molded plastic demand. The automotive industry is experiencing a significant change including increasing development towards vehicle weight reduction to improve fuel efficiency. Plastics play an important role owing to the capabilities to prove substantial weight reduction. Corporate Average Fuel Economy (CAFE) regulations to manufacture less fuel consumption automobiles may boost injection molded plastics market growth. A 10% reduction in weight results in around 5% to 7% fuel saving in an automobile. Moreover, the reduced weight also helps control the CO2 emission over the vehicle life cycle. Construction industry expansion owing to rapid industrialization should boost demand. Plastics usage in construction provides durability and cost effectiveness. Flooring, insulation, roofing, wall, doors, and window are the key applications. China was the major contributor in construction industry in APAC with total spending of above USD 1.63 trillion in 2015, followed by Japan and India, registering over USD 728 billion and USD 412 billion, respectively. High construction spending in the region will fuel APAC injection molded plastic market size. PP and ABS, which are the most predominantly used polymers, have seen a low cost curve over the last two years. However, with crude oil uptrend expected in 2017 and 2018, injection molded plastic market price trend is likely to see an upswing. Companies have started focusing towards developing biobased injection molded plastics owing to stringent environment regulations and to avoid crude oil dependence. This initiative may create more opportunities in global injection molded plastic market growth. Polypropylene (PP) injection molded plastic dominated the demand and was valued at over USD 72 billion in 2015. 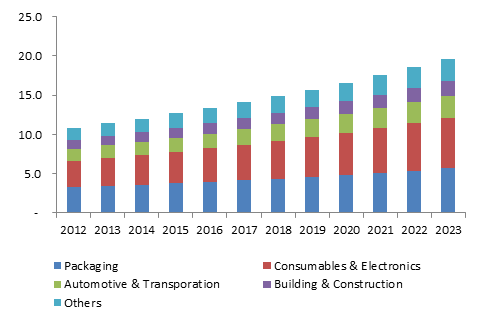 Rise in PP demand in automotive, packaging, and electrical & electronics industries owing to corrosion resistance & electrical insulation are among favorable factors to foster demand. Acrylonitrile butadiene styrene (ABS) demand is set to witness significant growth rate and poised to increase at over 5.2% CAGR up to 2023. ABS is widely used in medical devices due to its temperature and impact resistance, dimensional stability and corrosion resistance properties. This factor is considered to create more opportunities in healthcare sector. Consumable & electronics application demand was worth over USD 66 billion in 2015. Electronics industry expansion accompanied by cost effective electrical appliances availability were considered to be the stimulating factor to pave injection molded plastic market growth. Rise in demand for food processors, microwave, television, laptops, mobile phones, and refrigerator owing increase in disposable income and purchasing power created more opportunities and enhance market growth. In revenue terms, automotive & transportation application is set to witness highest growth rate, increasing with an estimated gains of over 5.7% up to 2023. Polymers offer flexibility in design to manufacture vehicle component compared to steel substrates, which may positively influence automotive plastics market demand over the next several years. Superior strength, easy mold-ability, scratch resistance, vibration & noise control, cabin insulation, and recyclability are the other key preferable properties. Interior bezels & armrests, keyless entry systems, radio controls, electronic module control housing and trim panel splash guards are some of the automotive applications. APAC injection molded plastic market size was dominant and was valued at over USD 76 billion in 2015. China, India, and Indonesia expect rapid industrialization, manufacturing industry expansion and favorable government norms including FDI & tax benefits, which may foster demand. North America, with dominant U.S. injection molded plastic market demand, is set to grow at more than 4.8% CAGR up to 2023. Rise in food & beverages packaging demand owing to increase in processed food & alcohols demand coupled with building & construction expansion are expected favorable factors to drive demand. Latin America expected growth rate at above 4.6% up to 2023due to abundant fossil fuel raw material availability and government support to initiate FDI in Brazil and Columbia. Global injection molded plastic market share is highly fragmented due to presence of numerous players and unorganized sector. Major participants include ExxonMobil, BASF, Dow, Huntsman, Eastman, INEOS, SABIC, Magna International, Newell Rubbermaid, Beckton Dickinson, and IAC group. Asia Pacific based manufacturers majorly focusing towards capacity additions in order to take favorable operational condition advantage and to gain economies of scale. Product portfolio expansion and differentiation are among the key growth strategies.